Welcome to the natural regional reserve of Capo Rama! The reserve was founded in June 2000 by the regional environmental office, which committed it the WWF Italy for management. In Sicily, regional reserves are founded by the local environmental office and are subsequently maintained by the province, regional Forest Services, environmental associations and universities. The territory of Capo Rama has always been noted for its rare wealth of natural environmental beauty. In its Plan of Production of 1968, the municipality of Terrasini declared the zone a “biotope of inestimable value” and placed a building ban into effect to further the protection of the area. The scenic value of the promontory of Capo Rama has been recognized and defended under law since 1939, while various other interests in archaeological, ethno-anthropological and paleontological studies strive to protect the scientific and historical significance of Cala Porro. The foundation of a protected zone on the promontory of Capo Rama was foreseen in the Regional Plan of Parks and Reserves of 1991 under the Regional Law n. 14/88, and was formalized on June 23, 2000 with ordinance n. 274/44 of the Department of Regional Territory and Environment. This act established the Nature Oriented Reserve of "Capo Rama" and furnished the goal of protecting the unique geological, floral and faunal emergences that characterize the promontory and the adjacent coastal areas that are entrusted to the WWF Italy. With the introduction of ordinance n. 250/GAB of 10.4.2005, the Department of Regional Territory and Environment established new perimeters of the Reserve, expanding the protected territory from 22 to 66 hectares. The territory of the Reserve falls wholly within the bounds of the wider Site of Community Importance (cod. ITA020009), termed "Cala Rossa and Capo Rama", established in 1998 in accordance with the Community Directive n. 92/43/CEE. Under code EUAP1101 the Reserve of Capo Rama is considered a protected area of Europe. 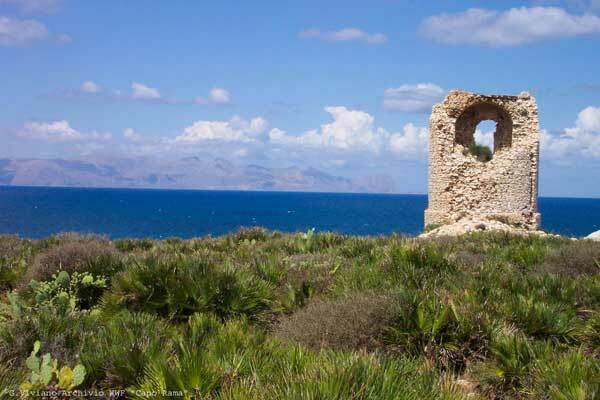 The protected area of Capo Rama is divided into two zones of distinct value: Zone A, which composes the integral area of the reserve, and Zone B, which serves as a buffering zone between the strictly protected Zone A and the surrounding developed environment. The low coasts of northwestern Sicily, sometimes sandy, sometimes rocky, overlook the sea in a succession of headlands, cliffs, coves, harbors and inlets. The most pronounced of these island coasts forms the Gulf of Castellammare, whose twisting coast of wide beaches is only interrupted to the west by the cliffs of the "Zingaro" Reserve, while to the east it encounters the promontory of Capo Rama. Situated at 38° 08' 31" latitude North and 13° 03' 16" longitude East, the Reserve is included in section 594050 of the Regional Technical Map and in table I.G.M.I. 249 III N.O. The toponym of Capo Rama is cited by many authors of the past, amongst which the noted Tommaso Fazello makes reference to "capo Ramo" in his work De rebus Siculis from 1558. The author writes that with the "promontory Egitarso" (the contemporary San Vito Lo Capo) forming the Gulf of Castellammare: "The other arm of this grand stretch is cape Ramo, where lies the military shipyard of Calaporro, and from one nautical mile towards land, one can see certain ruins of antiquity, although to what period these are attributed, I remain unsure". Capo Rama is included in the region of "Agli Androni", a toponym that derives from the Sicilian agghiannuni, "grand acorn", which references the fruit of the rare Kermes Oak (Quercus calliprinos). In the past, the species flourished abundantly along the coast of Sicily, however, it exists today only in limited areas as a relict vegetation. Only one of approximately fifteen of these plants in Capo Rama and the surrounding territory (the radius of one square kilometer) falls within the bounds of the Natural Reserve. The surface of the promontory is composed of a plain, closed to the south-southeast by mountains of modest elevations: Monte Pecoraro (856m), Monte Palmeto (645m) and Costa di Mirceni (531m). The eastern slope of the plane overlooks the picturesque the minor cliffs of Cala Rossa, from the center of which rises a small outcrop locally referred to as "l'isolotto" (islet). In the territory moving away from the coast, there are restricted strips of nature alternating with area of human developments. Up until a few decades ago, the plain was cultivated with vineyards, citrus, olive and sumac groves, while the slopes of the mountains, covered in fault detritus, were used to cultivate manna ash, carob and almond trees. Few traces of this antique agriculture are still detectable, appearing only sparsely in the forms of dry terraces and residual patches of vegetation. The plain has been intensely populated over the past twenty years and the effects of construction developments and other human activities have caused the decline of several species of the indigenous vegetation cover, such as the dwarf palm, the kermes oak, the mastic tree, and the wild olive tree. From an environmental standpoint, the area of Capo Rama represents the most important zone among those excluded from this damaging overbuilding for biotic and abiotic motives. In the example of the original scrub of the dwarf palm, there remain only limited residual strips along the coast ranging from Cala Rossa to the pebbly beach of San Cataldo. The distribution and individual occurrences of the plants passing through the promontory of Capo Rama are of significance. The palms of this dense grove, extending approximately five hectares, stand at just over a meter. The abundant limbs and brushy base of the plants are home to a rich biodiversity, providing further motive to target and carefully preserve this natural heritage. The promontory of Capo Rama is formed from a small, flat and triangular peninsula, which is incised by large marine terraces that were caused by erosion from the Pleistocene sea and are characteristic of this portion of western Sicily. The plane extends up to the large paelocliffs of the mountain slopes that run east to south-east, composing the top-part of an abrasion platform in which were deposited calcarenites in Quaternary shoals. The grand part of the city is built upon these rocks. An outcrop of older calcareous rock is visible at Capo Rama, which is partially covered by an exiguous stratum of "terra rossa" which lacks in mineral substance and provides an example of the typical patterns of alternation in carbonate successions. These rock formations represent the western edge of the "Monti di Palermo" complex, which are correlated by genesis, age and chemical composition. Being composed primarily of calcium carbonate and dolomite, these rocks were subject to karst dissolution by both meteoric and marine waters, which generated the original lithic sculptures of the outcrops as well as the formation of karst cavities that vary in size from a few centimeters to several meters. The topography of the reserve is characterized by the presence of an active cliff, i.e. of a rocky coast overlooking the sea, about 35m high, so that the slow and steady erosion of wave motion tends to retract and continuously change its appearance. Traces of sea erosion are indicated by a groove at the base of the cliffs, marine terraces, large oscillations that provide evidence of the sea level oscillations during the last million years, and the numerous caves, some submerged, emerged or partially submerged. Of these, only Nassi Cove, Cala Porro Cove and Madonna Cove fall within the territory of the Reserve. These coves are of marine and karstic origin. The cave of Nassi, accessible only by sea, owes its name to its usage up until a few years ago by fishermen for storing fishing traps (or nasse). Opening at the center of the cove, the cave of Cala Porro consists of a cavern about twenty-five feet deep and extending upwards for approximately two meters. Small tubular stalactites are visible within the cave, originating from the percolation of water from the rocks over time. Excavations carried out in the 70's of the last century have unearthed evidence of visitation of the cavity as a shelter and place of residence in ancient times (Mannino, 2004). On this same side opens the splendid "Cala Porro" with steep walls formed by a fault that reflect the waters below on the negative slope. These limestones, which have roughly NW-SE and dip about 30° SW, have been studied by experts from the University of Palermo: "in the terrain of the Triassic carbonate outcropping at Cape Rama it is possible to distinguish several stratigraphic bodies, which are often present in constant rhythms and allow one to recognize, in the geological history of the entire studied succession, a regular repetition of different environmental conditions "(Catalano et al, 1974). In the stratigraphic succession studied and measured at the Tower of Capo Rama, on the side facing the Gulf of Castellammare, three major lithofacies have been identified, each respectively corresponding to different depositional environments and follow one another cyclically as a result of repeated variations of the sea ​​level: 1) dolomitic limestone to megalodontides, with remains of large bivalves (Megalodon gümbeli and Dicerocardium sp. ), brachiopods, corals and gastropods deposited in an environment of back-cliff lagoon in shallow water, muddy seafloor, moderate hydrodynamics and frequent contact with the open sea; 2) and stromatolitic and loferitic dolomites, formed by algal laminae (stromatolites) and fragments resulting from erosion (loferites) indicating a coastal environment subject to periods of emersion, during which occur processes of desiccation enabling the transport of fossils by atmospheric agents. 3) Loferitic breccia formed as a result of weathering of the coastal plain exposing the deposits (dolomite, stromatolitic and loferitic) to meteoric agents for an extended period of time. The limestones outcropping at Capo Rama contain the fossilized remains of organisms that lived at the time and place of the deposition of the sediments. The microfossils and lamellibranchia Megalodon gümbeli allow the attribution these formations to the Triassic (Norian), with an age of about 220 million years. These bivalve mollusks, which today are extinct, resurface as fossils at Capo Rama where one can observe the thickness of their mineralized shells in the rock sections. The presence of the Megalodon gümbeli provides indication that the sediments composing these rocks were deposited in a lagoonal back-cliff environment, characterized by shallow water and weak hydrodynamics. The depositional environment would have corresponded closely to that which is now found in the coral atolls of subtropical seas. Resurfacing in the outcrops of Cala Porro are terrestrial gastropods (Helix sp.) and the remains of vertebrates firmly cemented in the "red earth" dating to the quaternary period, consisting of bone fragments and portions of a jaw. Lithodomes present in the rocky walls of the cove are characteristic of burrowing marine organisms, reflecting a period of immersion during the deposition of the limestone substrate. The dynamic and evolving natural system provides numerous physical and biotic factors, furnishing an environment in which the vegetation works to achieve its maximum floristic and physiognomic-structural complexity (potential natural vegetation). The ecological successions are established slowly over time with the development of plant communities, or plant associations, depending prominently on physical factors, especially soil and biotic conditions. The coastal environment of the cliffs, for example, affected by marine aerosols, insolation, gusty winds and, during some periods, marine sprays, is colonized by salt-tolerant plant communities. Among these communities, glasswort (Arthrocnemum fruticosum), sea purslane (Halimione portulacoides) and Boccone's sea lavender (Limonium bocconei) represent the dominant species. From a floristic point of view, they are accompanied by sea fennel (Crithmum maritimum), bird's-foot trefoil (Lotus cytisoides), European sea-heath (Frankenia pulverulenta), thymelea (Thymelaea hirsuta), the sharp rush (Juncus acutus) and where the substrata becomes sandy, vegetate the horned poppy (Glaucium flavum), the three-horned stock (Matthiola tricuspidata) and prickly saltwort (Salsola kali). The brushy vegetation expresses the highest floristic and physiognomic-structural complexity of sunny environments, characterized by summer drought; its structure emerges from the balance between sclerophyll shrubs and herbaceous species, while the tree layer is absent. This vegetation is located in proximity to halophytes and often time colonizes long stretches of coast affected by winds high in salt. The dominant species in this zone is the dwarf palm (Chamaerops humilis), the only palm native to Europe, manifested here in a dense grove that extends to 5 hectares in area surrounding the tower at Cape Rama, while its presence in the surrounding areas becomes gradually more sparse. The palm trees are environmentally associated with mastic (Pistacia lentiscus), tree germander (Teucrium fruticans), the Sicilian tea or hedge nettle (Prasium majus), wild asparagus (Asparagus acutifolius), and marine asparagus (Asparagus stipularis). Small grassland colonies form among the shrubs, which are forms of erosion characterized by ephemeral herbaceous plants, such as subhalophile autumn squill (Scilla autumnalis), the long-flowered crocus (Crocus longiflorus), Mediterranean steppegrass (Stipa capensis), the annual daisy (Bellis annua), the pygmy cudweed (Evax pygmaea), the dwarf iris (Iris sisyrinchium) and the sand crocus (Romulea linaresii ssp. linaresii). The areas of the Reserve, which in times prior to the institution suffered strong degradation of the vegetation as the result of overgrazing, fires and habitat alterations, in addition to erosion that depleted the soil, today consist of grasslands in which grow plants that are well adapted to this impoverished environment such as the common thatching grass (Hyparrhenia hirta) and asphodel (Asphodelus microcarpus). The areas furthest from the cost are characterized by olive shrubs (Olea europaea var. syvlestris) and tree spurge (Euphorbia dendriodes), which grow in association with the dwarf fan palm (Chamaerops humilis), ephedra (Ephedra fragilis), marine asparagus (Asparagus stipularis), tree germander (Teucrium fruticans), and the delicate narrow-leaved mock privet (Phillyrea angustifolia). These species have brushy morphologies and are evergreens, with the exception of the aborescent tree spurge that loses its leaves in summer. The coastal cliffs provide an inhospitable habitat for plant life given the poor soil substrate and high aridity, in addition to regular exposure to strong winds, sea spray and prolonged insolation. The vegetation that colonizes these areas consists of specialized species, well-adapted and stabilized over time, unless compromised by interrupting pollutants or particularly competitive non-native species. The plants have developed several specialized organs for the uptake and accumulation of water in this rocky habitat. Among the species that are found on the cliffs of the protected area, some of which are rare and /or endemic, there are: ever flowering candytuft (Iberis semperflorens), stonecrop (Sedum rupestre), rupestral carnation (Dianthus rupicola subsp. rupicola), Boccone's wild fennel (Seseli bocconei subsp. bocconei), helichrysum rupestre (Helichrysum rupestre var. rupestre), the common fig (Ficus carica), the dwarf fan palm (Chamaerops humilis), navelwort (Umbilicus rupestris) and western black spleenwort (Asplenium onopteris). To live in these particular environmental conditions, characterized by marine sprays, gusty winds, summer aridity, and strong sun exposure, which further facilitates the evaporation of water, the plants have evolved and modified certain organs. Examples of environmental adaptation are the development of the root system to grow parallel to the ground, which helps to increase absorbent surfaces. Other root systems travel far down in order to capture water and consequently swell the roots, which serve as water reserves in species such as the asparagus and asphodelus. The foliage of these plants have also undergone modifications: in some species they act as reservoirs accumulating water inside them, as in the case of the sea fennel and bird's-foot trefoil. Other plants display scales such as in the case of thymelea in order to reduce the surface of evapotranspiration. In some cases, as in those of the sharp rush and ephedra, the leaves disappear altogether. Other strategies to reduce the loss of water from the tissues of the plants are the thick hairs that cover the leaves and are often glaucous in appearance, such as those visible on the horned poppy and on three-horned stock. The presence of waxes is also an important factor as the waxes favor reflection of sunlight and limit evapotranspiration. The presence of bristles on the leaves and stems serves to limit perspiration and retain excess marine aerosols. In areas subject to constant wind, especially in coastal environments it is noted that plants take on a "pillow" form, increasing their resistance to strong winds. The taller shrubs such as the olive, however, typically assume the shape of a "flag" in the direction of the dominant winds. The territory of the reserve at Capo Rama, characterized by rich and diverse plant communities, provides the spatial heterogeneity that results in the availability of habitat and food resources for many species of invertebrates and, among the vertebrate species, reptiles, birds and mammals. The cliffs are frequented throughout the year by various species of birds, some of which are easily observable, such as the yellow-legged gull (Larus michahellis) and the rock dove (Columba livia), others are more elusive, such as the common kingfisher (Alcedo atthis) and the blue rock thrush (Monticola solitarius). The pigeons nest in the numerous crevices of the cliffs, as well as the Eurasian tree sparrow (Passer montanus), the Spanish sparrow (Passer hispaniolensis) and the common swift (Apus apus). The European kestrel (Falco tinnunculus), a nesting species on the reserve, can easily be seen in the typical position of the "windhover" that allows him to remain suspended in the same spot with rapid wing movements to scan the ground and launch swooping down on his prey. More rarely, however, you can spot the peregrine falcon (Falco peregrinus) frequenting the cliffs and the more isolated areas of the reef. The coastal environment is of great importance not only for the year-round residential avifauna but also for migratory species; in fact, during the spring and autumn, one can see several examples of the great cormorant (Phalacrocorax carbo), the grey heron (Ardea cinerea), the little egret (Egretta egret) and often flocks of cranes and anatidae flying in formation across the sky at very low altitude. From spring through autumn it is easy to spot many butterflies in areas close to the cliffs. They visit the horned poppy flowers, Boccone's sea lavender and bird's-foot trefoil: the common blue (Polyommatus icarus), the common copper (Lycaena phlaeas), the six-spot burnet (Zygaena filipendulae), which construct their chrysalis on the branches of Boccone's sea lavender the common clouded yellow (Colias crocea). Much more heterogeneous is the fauna of the brush environment, which includes several species of birds, mammals and often reptiles in the clearings amongst the thick bushy vegetation. The species most representative of the Mediterranean brush is undoubtedly the Sardinian warbler (Sylvia melanocephala), as it prefers the shrubby evergreen vegetation for nesting. Also common are other passerines such as the European goldfinch (Carduelis carduelis), the crested lark (Galerida cirstata), the stonechat (Saxicola torquata) and the common blackbird (Turdus merula) with their unmistakable melodious song. Occasionally it chances that one is even able to see the buzzard (Buteo buteo). Throughout the spring and summer you may spot the hoopoe (Upupa epops) while it circles in in the sky or the fluttering common swift (Apus apus), the Alpine swift (Apus melba), the barn swallow (Hirundo rustica) and the common house martin (Delichon urbica). In the autumn-winter period the brushy habitat is also frequented by the European robin (Erithacus rubecula), the common starling (Sturnus vulgaris) and by the white wagtail (Motacilla alba alba). Where shrub the vegetation gives way to the grasses, from which outcrop stones and rocks, one can easily observe the two species of lizard (Podarcis wagleriana e P. sicula), the western whip snake (Hierophis viridiflavus), and more rarely, the ocellated skink (Chalcides ocellatus). Among the mammals that frequent this environment there is the European rabbit (Oryctolagus cuniculus), of which there are abundant traces, the European hedgehog (Erinaceus europaeus) and the red fox (Vulpes vulpes). The dry habitat of the stonewalls and the rocks are frequented by the Sicilian wall lizard, an endemic species of Sicily. The male of this species sports a brilliant green dorsal while the female displays olive-green streaks and both show well-defined stripes on their oblique. In the grassy zones, on the other hand, lives the Italian wall lizard, which has a lower aptitude to climb. An additional yet more elusive reptile in the protected area and common to Sicily is the western whip snake, which feeds on small mammals, lizards and young birds. Their coloration ranges from light grey or brown specimens at a young age to a black color in adults. The brush habitat is suitable for many insects: from the seven-spot ladybird (Coccinella septempunctata) and the firebug (Pyrrhocoris aptera), to camouflaged grasshoppers and the wasp spider (Argiope fasciata), an arachnid that weaves its web among the brushy vegetation. From the leaves of the dwarf palm hang the typical umbrella-shaped nests of the paper wasp (Polistes gallicus). From March to October one finds a great number of colorful butterflies flitting amongst the vegetation in bloom: from the common blue (Polyommatus icarus), the elegant old world swallowtail (Papilio machaon) and the scarce swallowtail (Iphiclides podalirius), from the lemon-yellow Cleopatra (Gonepteryx cleopatra subsp. cleopatra) to the bronze wings of the common copper (Lycaena phlaeas), the flamboyant painted lady (Cynthia cardui) to the black dotted cabbage white and the small white (Pieris brassicae and Pieris rapae). The lowest part of the cliffs, subjected to heavy wave action and alternation of the tides, is home to many living organisms of both plants and animals. On the plane of the circalittoral environment grows several species of algae that provide food for shellfish such as Patella cerulea, Patella rustica, Littorina punctata and Littorina neritoides, which live firmly attached to the rock walls. A particular structure known by the name of "trottoir a vermeti" (from fr. "sidewalk"), is found at the base of the cliff, which was observed for the first time in 1854 by the French naturalist Arman De Quatrefages on Isola delle Femmine. The trottoir is an environment exclusive to the intertidal area, consisting of Vermetid mollusks and calcareous algae, "which is an extreme avant-garde of coral reefs" (Riggio, 1987). In the presence of outcropping cliffs, the trottoir may extend to several meters in width, while at Capo Rama where the walls of the cliffs descend steeply to the sea floor, it takes on the appearance of a border that wraps uninterrupted around the cliffs at the height of the beating waves. The principle constructing organism of the trottoir or reef (from eng. "barrier") of Vermeti is the Dendropoma petraeum, a marine mollusk endemic to the Mediterranean, which is equipped with a convoluted tubular shell and closed by an operculum, which is visible at the subsurface of the rock. In the existing formations along the coast of the Natural Reserve "Capo Rama" predominates the calcareous alga Lithophyllum totuosum, resistant to the strong hydrodynamics of this environment. The trottoir hosts the highest marine biodiversity of the sea with several hundred species of mollusks, algae, crustaceans, fish and other organisms. On the extreme offshoot of the promontory of Capo Rama stands the watchtower. Centuries old, it stands as a silent witness of an attempt to prevent the ruinous raids of Anglo-Barbary pirates and corsairs from damaging the coastal populations. Typologically attributable to the fifteenth century, the tower of Capo Rama is the oldest existing building on the territory of the Municipality of Terrasini and among the first of the towers to be built in the Gulf of Castellammare and throughout Sicily. Upon recognizing the strategic importance of the site, the King of Sicily, Martin the Younger, instructed the building of the tower on Capo Rama in his plan for the fortification of the coast of Sicily in 1405. The tower, which has inherited its name from the headland, represents the most western structure part of a system of senatorial towers consisting of ten stations in the coastal defense of the city of Palermo. The tower was in visual correspondence with towers Alba and Molinazzo to the northeast and Toleda to southwest, but was capable of communicating with other stations located along the coast and inland. The watch was alternated under the surveillance of two guards, who became three in periods of high vigilance and were paid by the Senate of Palermo. The tower of Capo Rama was active for four centuries, however, from the works of historians, we learn that unlike the towers arising in the late sixteenth century from the instructions and projects of architect Camillo Camilliani, the tower at Capo Rama was never equipped with artillery given that the physical characteristics of the structure were not suitable to support the weight and dynamic stress of the weaponry in use at the time. The tower was built from irregular pieces of local limestone and raised in concentric and parallel rows cemented with a mixture of mortar and sand. The roof was covered with a barrel vault (dammuso) from segments of plastered tuff. The tower is divided into two levels: the first floor with a circular room and the terrace (astracu) from which parted the visual signals of smoke or fire (fani). Like most of the antique towers, the example at Capo Rama is a circular building of modest size with thick, sealed outer walls. The linearity of the exterior wall is interrupted by an offset protruding from the base of the tower, designed to level out the unevenness of rocky soil. The building had two entrances at the ground level, one facing the sea and the other turned landwards; the ultimate also serving as an access reached by a retractable staircase. In a watercolor depiction of the Capo Rama tower from 1578 ​​by engineer Tiburzio Spannocchi, the trapdoor to defend the entrance is visible, which no longer exists, however, due to collapses that occurred in that part of the structure. A first intervention of consolidation was carried out in 2005, targeting the badly damaged southern side of the tower while a subsequent recovery was executed in 2007. The Institution Management supervises and monitors the activities that take place within the reserve in order to preserve and protect its natural emergences. Among the tasks set by the institution decree, the promotion of scientific research in the protected area aims to deepen the knowledge of the geology, flora and fauna. The WWF organizes guided tours for groups and school groups by reservation and by request at the offices of the Reserve. Environmental education activities with students of all ages remain of great importance for introducing a growing audience to the Natural Reserve of Capo Rama. Activities consist of classroom meetings taught with the help of multi-media exercises and/or guided tours of the reserve. The tour, which lasts about two hours, takes place on a path of easy access that starts from the coast and continues through the low vegetation and bushy. Access to the reserve is free.